When it comes to TV channels American consumers say they absolutely must have, ABC, CBS, NBC and FOX are still the four ‘must keep’ TV brands, according to the 9th edition of our annual syndicated television tracking survey, Must Keep TV. ABC retains the top “must keep TV” channel title in America, followed very closely by CBS. NBC is #3 for the third year in a row, beating out FOX on a total population (aged 12 and older) basis. Discovery is the top cable brand in America in 2016, coming in at #5 after the four big nets. This year HBO is in the #6 spot, its highest overall rank to date since 2007. 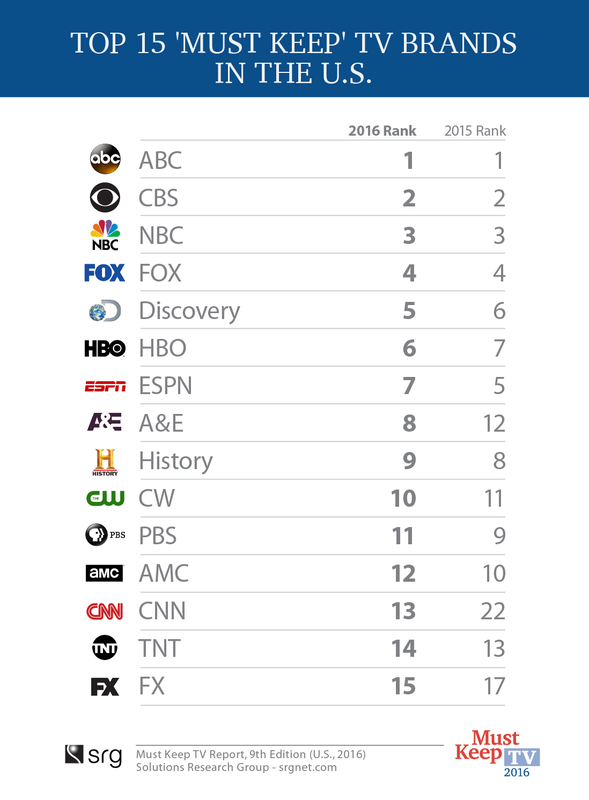 ESPN came in at #7 followed by A&E, History and CW this year. PBS is now #11, after spending 3 years in the Top 10 and AMC lost some momentum compared to last year and lands at the #12 position (vs. #10 in 2015). CNN records its best-ever showing coming in at #13 ‘Must Keep’ TV brand overall, up from #22 spot only last year. The only other time CNN broke into the Top 15 was in 2008, another election year, when it was ranked #14. Top 5 ‘must keep’ brands for Women 25-54 stay almost the same as last year: ABC, CBS, FOX, NBC and Discovery (FOX is ahead of NBC this year). Entering into the Top 10 this year for the first time ever are A&E and AMC. Food is back in the Top 10 after dropping out last year and Disney is back on the Top 10 list for the first time since 2014. History slipped out of the Top 10 to come in at #15 while Lifetime is also out of the top 10, declining from #10 to #22. A dozen major ownership groups account for most of the 73 TV channel brands included in SRG’s study. Of the 8 major Viacom brands tracked by SRG, none ranked in the Top 20 for the first time since 2007. Spike (#48), TV Land (#52), VH1 (#55) and CMT (#66) showed declines. BET was an exception, ranking #40 overall and as the #4 ‘Must Keep’ brand among African-American audiences. Vast majority of Netflix users still have paid TV and value major networks and big cable channels. ABC, CBS and FOX are at the top of ‘must keep’ brands for Netflix streamers and HBO, A&E, AMC and CW are even more valued than average according to the results of the 2016 study. ABC wins the top brand honors among the African-American audience followed by FOX this year, for the first time. CBS, BET and NBC round out the top 5. Momentum brands this year include AMC, A&E and The Cartoon Network, USA and FX. ABC wins among Latino viewers as well as top brand, followed by FOX, CBS, HBO, A&E, FX and NBC. Trending up this year are: A&E, Disney, AMC, Nickelodeon and MTV. 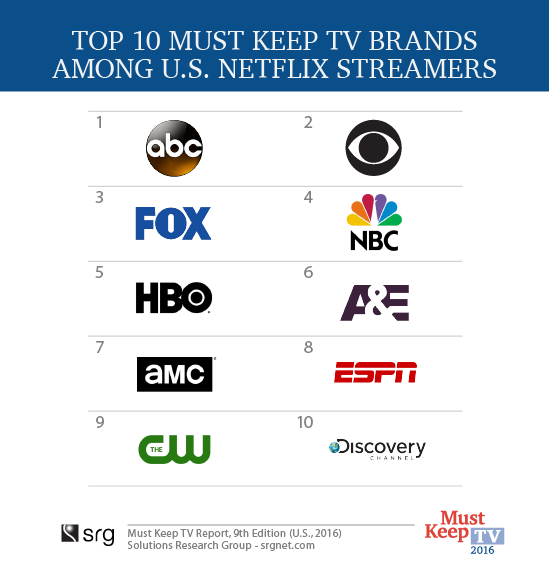 ‘Must Keep TV’ tracking is an independent syndicated brand tracking survey conducted by Solutions Research Group (SRG) among representative sample of American consumers. This is the 9th edition of the survey since 2007. The questions have been fielded and presented in the same manner each year. The 2016 research is based on online interviews with 1,400 American consumers aged 12 or older conducted in April 2016 – the sample captures and represents all major population segments. Respondents are shown a list of 73 leading network/cable brands and are asked to identify which ones would be on their ‘must keep TV’ list if they had to choose a limited number. Sample design is balanced by geography, gender and ethnicity, including African- American and English-speaking Hispanics according to known universe parameters.